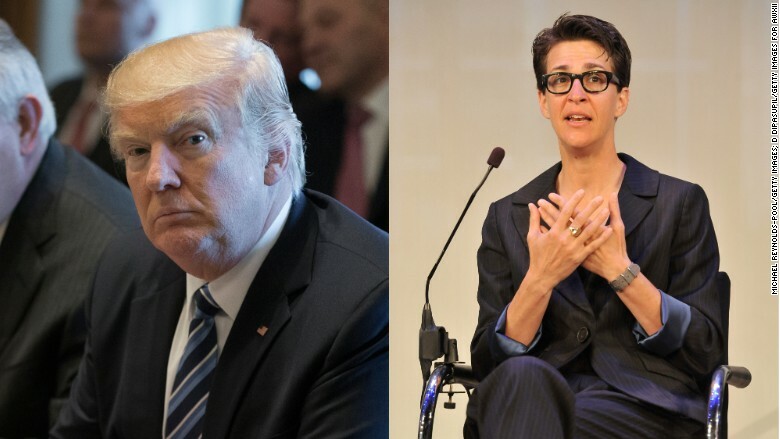 MSNBC's Rachel Maddow teed up a major scoop about President Donald Trump's taxes on Tuesday night -- only to end up disappointing many in the political-media establishment with a report that was widely characterized as overhyped. The big reveal, which Maddow did not get to until after a lengthy monologue and commercial break, showed that in 2005 Trump paid $38 million in federal income taxes on a reported income of $150 million. That information was based on two pages of an IRS 1040 form supplied to journalist David Cay Johnston, who was a guest on Maddow's show. By the time Maddow got around to sharing that information, it had already been supplied by the White House and published on The Daily Beast, where Johnston is a columnist. Even so, the documents left the public with more questions than answers. The decision to hype the scoop -- Maddow first tweeted her all-caps "BREAKING" alert at 7:36 p.m. ET -- disappointed many journalists, who felt that Maddow had undermined legitimate inquiry into Trump's tax returns. It also disappointed Democrats, including Hillary Clinton's 2016 campaign press secretary Brian Fallon. Before Maddow's broadcast, Fallon retweeted the breaking news alert and called it "the holy grail." After Maddow showed her hand, Fallon wrote: "Dems should return focus to Trumpcare tomorrow & the millions it will leave uninsured, not get distracted by two pages from '05 tax return." Finally, Maddow's handling of the tax returns gave the Trump White House and pro-Trump conservatives like Sean Hannity and Laura Ingraham an opening to mock NBC and the media for "hysterical" reporting. And they did so for nearly on hour on Hannity's program on Fox News. Even CNBC took a dig at its sister network, with a headline that read: "Donald Trump just got a nice victory, thanks, of all people, to Rachel Maddow." If Maddow's report did anything to advance serious inquiry into Trump's taxes, it was by forcing the White House to demonstrate that it could disclose the president's tax information, despite his refusal to do so on the grounds that he is under audit. "The release of the top pages of Trump's 2005 tax return is a useful start, but is a drop in the disclosure bucket of what Trump owes the American people," Edward Kleinbard, the Johnson Professor of Law and Business at USC Gould School of Law and a former chief of staff at the Joint Committee on Taxation, told CNNMoney. "We're not talking about some collective prurient interest in his private affairs here. Only complete returns can resolve the questions swirling around his alleged financial obligations and sources of income, such as Russian oligarchs or other sovereign countries," Kleinbard said. "The President can and should put these and similar issues to bed by releasing the entirety of his tax history, just as other presidents have done for decades." Overall, the story coming out of Tuesday night's broadcast was not so much about Trump's tax returns as it was about the disappointment in Maddow's handling of them. "The only news out of this is that the White House CAN release the President's taxes, despite what campaign said," Mo Elleithee, a longtime Democratic operative, wrote on Twitter. "Which we all suspected."